(Beijing) Scientists at Tsinghua University have successful reactivated cut nerves in bullfrogs’ peripheral nervous system. Instead of suturing together severed nerves, the team lead by Jing Lui applied an alloy composed of 67% gallium, 20.5% indium, and 12.5% tin by volume, into the nerves’ severance points with a capillary channel. Liquid metal therapy is believed to be benign. The procedure involves cutting the frog’s calve nerve, then inserting each cut end into a capillary filled with the electrically conductive liquid GaInSn alloy, which conducts electricity at several orders of magnitude lower than do conventional suturing techniques. Nerves grow particularly slowly (in the standard suture process); as nerves repair muscles atrophy in the meantime. 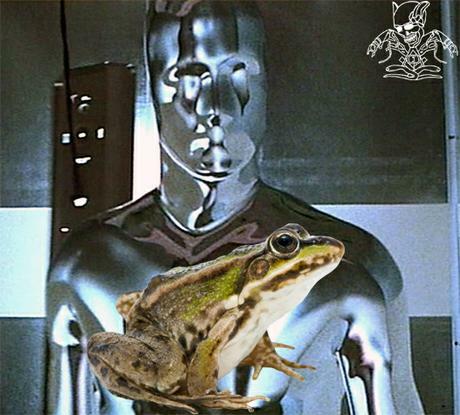 Because liquid metal is, of course, clearly visible in an X-Ray, it can be removed later, once the frog’s nerves regrow. The alloy’s high electrical conductivity enabled impulses to successfully travel through the prosthetically reconnected nerves, which immediately restored the frogs’ motor functions. One presumes the the frog need not wait to hop.